I don’t even want to think about how much money I’ve spent on nicotine. Back when I started smoking Pall Malls in Florida, they were $4 a pack; when I quit smoking cigarettes, I was living in New York City, where they cost triple that amount. Like many people, I segued from combustable smokes to vaping—and, more specifically, to that USB-esque device called Juul. I thought at the time I switched that I’d be saving money, but it’s not even clear that theory panned out. Instead, it often felt like I’d just swapped one costly addiction for another. I’ve since decided to quit Juuling too, after almost two years of siphoning money to the start-up. I know I brought this on myself, but it still makes me very mad. The only way I could come close to breaking even at this point, I decided recently, was to get in on the vape racket myself. Juul Labs has been valued as highly as $16 billion, a whopping sum for a company that just introduced its signature product a few years ago (when it was still part of PAX Labs). If I could ignore the lawsuits claiming teens have been “unable to stop” Juuling, the FDA crackdown, and the probes from law enforcement types like the Massachusetts attorney general—which is to say if I could just not let morality play into the equation at all—I stood to make a lot of money, I figured. The only problem was that I didn’t have the dedication (or lung capacity) to be one of those people who make thousands vaping on YouTube, and Juul is a private company, which is to say it’s not publicly traded on the stock market. That’s around the time I stumbled across a nugget of seemingly priceless information: “Current Juul shareholders include Tiger Global Management and the mutual fund firm Fidelity Investments, according to publicly available disclosures,” Bloomberg wrote in an article about the company in June. As a lay investor whose reporting on personal finance has rarely entered the realm of Wall Street speculation, I wasn’t sure what disclosure form that information was culled from, nor how many other shareholders might have gone unmentioned. (The Wall Street Journal noted that other early investors included the venture firm Tao Capital.) But reading those words felt like finding the skeleton key that would allow me to invest in the small device that had, until very recently, helped order my very existence. 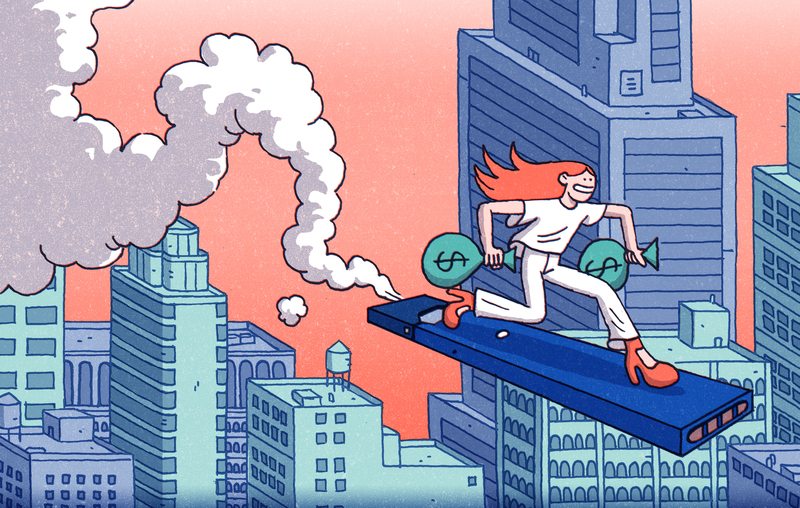 Seemingly hot on the trail of Juul riches, I decided to ask experts from the impossibly arcane world of high finance to explain how I might get in on the action. What came next made me even more irate than the fact that I’d spent large sums of money on nicotine in the first place. Reaching out directly to Juul for help investing in their continued growth seemed like a dead end—I didn’t immediately hear back, which, why would I? More strangely, an expert I’ve used as a finance source before hit me back with a copyrighted, vaguely conspiratorial screed he’d penned about the elitism of institutional investing. I shared his skepticism of these people, but the fact that he wanted to sell me the information did not bode well. Eventually, through a recommendation, I came upon a paper called “Mutual Fund Investments in Private Firms.” Two of the women behind the study quickly told me that my running suspicion was not far off: I was more or less barred from getting rich off of Juul because I’m not part of the financial class. More specifically, when I asked co-author Michelle Lowry, a professor of finance at Drexel University in Philadelphia, how I might get involved with a shareholder like Tiger Global Management, she told me I couldn’t because I wasn’t a “qualified” or “accredited” investor—someone who earned more than $200,000 each of the past two years and doesn’t plan on stopping anytime soon. As she explained, the Securities and Exchange Commission (SEC) has different transparency rules for the various kinds of funds out there. Hedge funds—which theoretically mitigate risk by taking both short and long positions but often engage in reckless behaviour anyway—are the provenance of rich people who supposedly know what they’re doing, or at least are less likely to lose their shirts while gambling. They often get exemptions from making what they do public. Mutual funds, however, are required to disclose a bit more information about their holdings. That made Fidelity Investments an appealing option, though with lower risk comes lower reward. Undeterred, I decided to take a look at the corporation’s website. I typed in “JUUL” and was easily able to find a fund that counted the company among its top-10 holdings. However, a Fidelity flack clarified to me over email that the fund was only available for investment, maddeningly, by other mutual funds. Meanwhile, another Fidelity search showed me that there were over 10,600 other mutual funds on offer that I would presumably have to inquire about individually. This was not going to be that simple. What I’d learned from speaking with Lowry, however, is that in order to gain some sense of what any given mutual fund is invested in, you can type the name of the fund into Google, plus the term “CIK”—or Central Index Key, a unique identifying number. Once you find it, you can pop the CIK into an SEC database called the Electronic Data Gathering, Analysis, and Retrieval system (EDGAR). From the list of forms that come up there, you can look for the most recent one labeled N-Q, which is basically a quarterly report. From there, you can click through to get at least an idea of what the fund actually holds. Though the process is aided by some degree of technical knowledge, it’s easy to replicate. But what if you—like I was—are working backward and know the name of the holding but not the fund? “The short answer to your question is that it’s very hard,” Yiming Qian, a co-author of the aforementioned paper and business professor at the University of Iowa, told me when I called her. But just as I was about to say goodbye and despair, Qian conducted a feat of wizardry. As it turns out, I may not have money, but Qian had a very particular set of skills—coding skills, and a vast knowledge of databases most laypeople don’t even know exist. First off, she told me about a site called Crunchbase. While we were on the phone, she had me go there and type in “JUUL Labs,” which brought up all kinds of info about the company, including details on its venture rounds. If you click on one, you can scroll down and find a link to an SEC filing form known as Form D. For our purposes, this is basically the document you file when you’re in the early stages of being a company, as opposed to one that has already had, say, an initial public offering. What’s important is that you can scroll down to Section Nine of a Form D, which showed that only type of securities offered by Juul Labs—at least in this latest funding round—were in equity. With that information, Qian was able to use her web crawling skills to look through all of Fidelity’s CIK units that contained actively managed equity funds, type in each to EDGAR, and produce the report we were looking for. Scrolling through it and locating Juul, I saw that just a tiny percentage of the Fidelity OTC Portfolio holdings resided in “tobacco,” and only a subset of that was in the company I was looking for, as opposed to, say, Philip Morris International, Inc. Theoretically, you or I could look this fund up by its ticker symbol—FOCPX—and buy some of it pretty easily. But it wasn’t clear how much good investing a modest amount in a massive fund with a microscopic piece of Juul would do. In other words, my get-rich-quick scheme was in more trouble than ever. Unless I suddenly became loaded enough to own or invest in a hedge fund or private equity firm, getting rich (or just a tiny bit richer) off Juul was looking pretty much impossible. Still, Lowry told me to be grateful for any scraps I could at least theoretically get of the vape company’s enormous valuation. She explained that mutual funds are increasingly trending toward investment in private firms. Now that they’re starting to dip their toes into that sector, it gives regular Joes like you and me a chance for what people in the business might call “exposure”—or a taste.